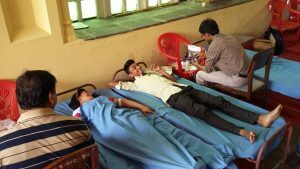 The port ico of St Paul’s Cathedral in Kolkata was converted into a makeshift clinic on 15th March as volunteers lined up to donate blood and help save the lives of others. The event was organised by Life Care Bank in collaboration with CRS and supported by the Indian company Larsen & Toubro. In total over 100 people attended, 60 of whom were eligible to give blood. Donors rested on lines of beds and recovered afterwards with tea or glucose water; they were also given food packets and a small token of appreciation from Larsen & Toubro.